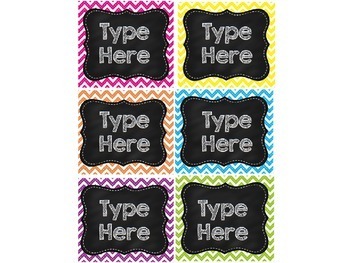 These EDITABLE Chevron Chalkboard Classroom Labels will organize and brighten your room! Use these to label your word wall and objects around your classroom, to create name cards for your students, or to add a punch of color anywhere! You must have POWERPOINT to edit these labels and make them your own. There are two pages/slides in this document, but the second page/slide is a .pdf thumbnail for display on TpT. You will edit this document using the first page/slide to create your own bright chevron and chalkboard classroom labels. I used KG SECOND CHANCES SKETCH font. To download it for FREE, go to https://www.teacherspayteachers.com/Product/KG-Second-Chances-Font-Personal-Use-716428 ! I hope you enjoy these labels as much as I do! Please be sure to rate this product, then follow me for more super cute classroom essentials! Thank you!